ELSTREE 1976 is a fairly conventional talking-heads documentary about ten people who worked on the original Star Wars movie at Elstree Studios as bit part players or extras. The first half hour gives us a collage of their rather unremarkable lives up to that point - varying from pro actors getting experience on the London stage to models and aspiring showmen coming to the film via Central Casting. This is the slowest part of the film because all of us Star Wars fans are keen to get to their experiences on set. When we get there, there’s an overwhelming agreement that the sets were amazing and that George Lucas was doing something very different, although few could’ve predicted just how successful the film was to become. Only David Prowse (Darth Vader) has a more starry experience, being invited to lunch with Alec Guinness before shooting. But almost as soon as we’ve got to Elstree, we’ve left again, into the long half-life of the actor now forever associated with an iconic film. Some of the actors went on to star in other films, and others dissolved into ordinary life. David Prowse evidently had some beef with George Lucas who thought he was just a man in a suit, and has been banned from the official conventions, but attends all the others. We get a glimpse into the weird world of the ultimate fan gathering autographs of bit part players as a kind of religious artefact being in some way connected with their favourite films. More bizarrely we discover the elitism within the world of actors - credited actors vs extras - and how the former can snub the latter. The result is a film less to do with the making of Star Wars than with how ordinary people deal with a bizarre after-life of fame. It’s an irony not lost on the actors who got their face on screen that the ones behind the iconic masks are the most sought after. The actors who play Greedo and Bobba Fett are particularly charming about that. But I couldn’t help but feel that there was less gritty on-set anecdotage than I was expecting from such a film, and we could have easily lost ten minutes of action from the opening act. Overall, then, a bit of a disappointment, although light-hearted and easy enough viewing. 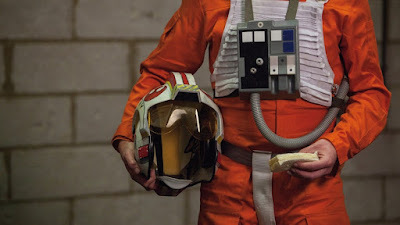 ELSTREE 1976 has a running time of 100 minutes. It does not yet have a commercial release date.